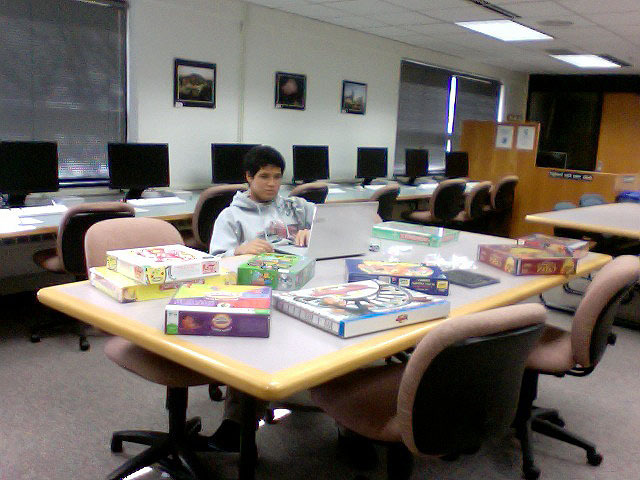 Juan Luis awaits students on Visit Gustavus day with a table full of entertaining board games. A great way to learn foreign languages is using board games. With this in mind we have purchased a number of board games in the various languages we teach at Gustavus. Some of the games we have include Monopoly in Spanish, a Russian version of Scrabble, Settlers of Catan in German, and Cranium in French. We also have special 10-sided dice in all of the language we teach which have the words for each number spelled out on the different sides of each die. While this is a new idea for the Culpeper center, we hope it will help to create the kind of atmosphere we hope to have more of in Culpeper. We hope to create and use language instead of just learn about it!